(TFP Student Action) With Oklahoma City's apparent stamp of approval, satanists were granted permission to hold a public sacrilege in front of St. Joseph Old Cathedral on Christmas Eve, December 24, 2015. Adam Daniels -- the same satanist who sponsored a public, satanic Black Mass in 2014 -- told The Oklahoman that he plans to pour costume blood over a statue of the Virgin Mary, treated with "sulfur powder and ash." This public attack against the Mother of God on Christmas Eve is more than a morbid cry for media attention and should be called out for what it really is: religious persecution with City Hall approval. The planned sacrilege is a direct sin of hatred against the Mother of God who is especially honored by Catholics in America under the title of Our Lady of the Immaculate Conception, patroness of the United States. To dismiss this satanic desecration right in front of St. Joseph Old Cathedral as a simple publicity stunt is to ignore the grave nature of this public sin and its consequences for our nation as one nation under God. The uptick of Satanism and its repeated attacks against the Faith are designed to desensitize average Americans towards evil and wear down the moral fibers of our beloved nation. 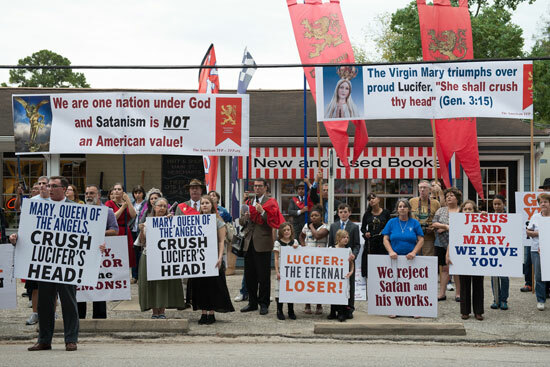 A "church" to Lucifer was recently opened in Texas. Last year, satanists performed a public Black Mass in Oklahoma City. And now there's this. What will be next?